Edward Hasbrouck, "The Practical Nomad"
What's at stake in the European Union PNR debate? Are TSA actions subject to judicial review? Edward Hasbrouck v. U.S. Customs and Border Protection | Papers, Please! CBP Intelligence Records System (CIRS) | Papers, Please! March | 2019 | Papers, Please! 01 | April | 2019 | Papers, Please! Edward Hasbrouck | Papers, Please! Freedom To Travel | Papers, Please! Papers, Please | Papers, Please! REAL ID | Papers, Please! Secret Law | Papers, Please! Secure Flight | Papers, Please! Surveillance State | Papers, Please! Contact Us | Papers, Please! Featured Cases | Papers, Please! 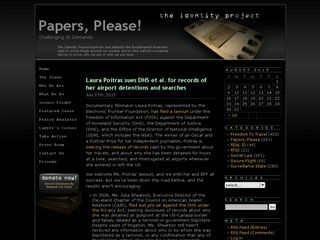 Friends of The Identity Project | Papers, Please! Lawyer&#8217;s Corner | Papers, Please! Foti v. McHugh | Papers, Please! 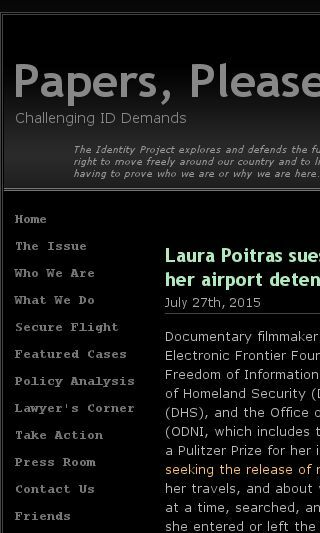 Gray v. TSA | Papers, Please! Ibrahim v. DHS | Papers, Please! State of New Mexico v. Phillip Mocek | Papers, Please! Phillip Mocek v. Albuquerque et al. | Papers, Please! Policy Analysis | Papers, Please! Press Room | Papers, Please! Latest News | Papers, Please! Request Your Secure Flight Records | Papers, Please! Why Secure Flight Won&#8217;t Make Us Safer | Papers, Please! Take Action | Papers, Please! The Issue | Papers, Please! What We Do | Papers, Please! Who We Are | Papers, Please!